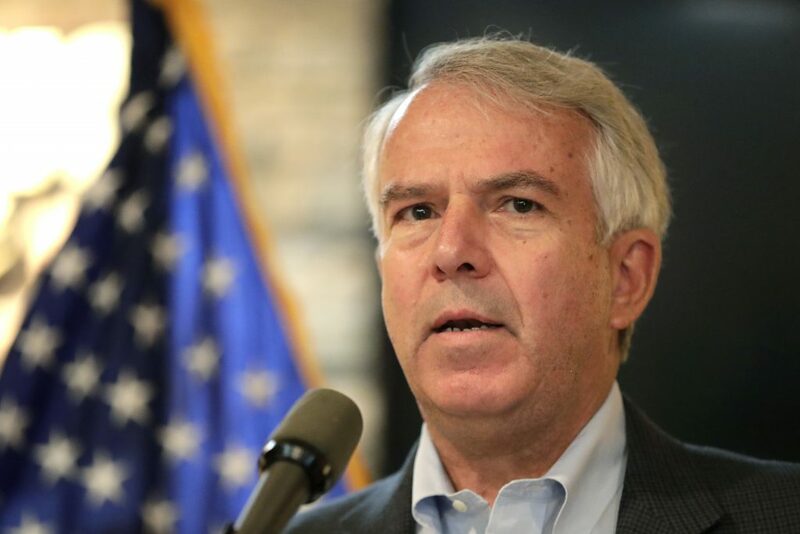 Robert Hugin is tackling Democratic incumbent Bob Menendez’s bid for a third term because, he told Hamodia, he would be “morally offended” if the senator whose corruption trial ended in a mistrial were allowed to glide to re-election. The interview with Hugin, a former Marine and pharmaceutical executive, took place by telephone, but the Republican made a campaign promise to come visit in person if he’s elected. It was not made with the same ironclad assurance as his healthcare and immigration planks were announced, but we’ll take it in stride. Great. So a campaign pledge is a visit to Brooklyn. Usually it’s a visit to Israel, but over here it’s to Brooklyn. Listen, we can do both. I was in Israel a few months ago right when the embassy was being moved. I actually went the day after. I met with [former Gen.] Uzi Dayan and had good discussions on the security issues. We were able to fly up right up to the Lebanon border and see where Hezbollah with Iranian support has moved into the urban areas and then into the Golan Heights and the West Bank. This was a great experience: to really see firsthand a lot of the issues. What’s clear to me is that we’ve got to make sure that this whole renegotiation of the Iran deal is fixed, because you can see firsthand what’s happening in terms of the Iranians trying to build a permanent military presence in Syria. That is obviously a non-starter for Israel but has to be a non-starter for the U.S. also. On a practical level, what lesson did you take away in regards to Israel’s security as a potential lawmaker? I think the issues of the qualitative military age is very important. Israel’s an important ally of the U.S., and I think the relationship is a special one. The Memorandum of Understanding needs to be really fully supported in ensuring that the defense of Israel is secure. And so, I think that’s something that we need to be very strong on. I think it was Senator Graham who said that the Memorandum of Understanding should be tweaked to allow Israel to request additional funding. I don’t know the specific details, but in general I believe that flexibility is an important issue. You don’t want to be tied to something that could be 10 years old and not have the opportunity to evolve and change and respond to circumstances that might require the opportunity to do things differently. So, I’m in principle supportive, yes. While we’re on this topic, let me just jump in with this: Your opponent, Senator Menendez, has an excellent relationship with Israel. He was one of a couple of senators who voted down the Iran deal. Some have been saying that his whole prosecution was started because of that. You don’t believe that, though, do you? I hope not. Anybody who believes that is just not following the facts. If you look at his self-proclaimed best friend, Sal Melgen was convicted of 67 felonies for defrauding Medicare. Sixty-seven felonies. And this is the guy he was lobbying for, and this guy was performing unnecessary procedures on senior citizens for his Medicare benefit and blinding them with unnecessary procedures. So, anybody who says this was political hasn’t read the trial transcript and seen the things that have happened. And one of the things we’re doing is to make sure that people understand the issues, because I think Senator Menendez has in the past been courageous in his support of Israel, and I would not take anything away from what he’s done in his support of Israel. I do think in the last year or two he’s become more partisan, and unfortunately Israel should not be a partisan issue, but he certainly did not support and attend the move of the embassy to Jerusalem. And he hasn’t been supportive of the Iran nuclear deal, which needs to be renegotiated and redone now because of the pressure of the progressive wing of this party saying that’s not the Democratic talking point anymore. So, I think he has been supportive of Israel, and I’m not looking to out-Israel Bob Menendez. I just know that Israel will have as strong a friend in the Senate no matter who wins, if not a stronger one when I win and when the Senate opens in January. Was justice not done when his trial ended in a mistrial? The answer, to me, to that is very clear, when you read the bipartisan Senate Ethics Committee letter. That letter, which was drafted by Washington’s greatest lawyers with bipartisan support, said he was guilty, he violated federal law, he abused the power of his office, he disgraced the Senate. And we know he embarrassed all the people of New Jersey. As a pharmaceutical executive, you have a unique perspective on healthcare and what drives up costs. As a senator, you’ll be on the other side of the table. Is there any regulation or particular law that you would want to tweak to make it easier to lower costs on medications? There are a number of things we do, and I actually have a five-point plan to address the issues. Let me just tell you, strategically or philosophically we need a major transformation of our health care delivery system in our country. It was designed 70 years ago as a sick-care system for a culture and an economy that doesn’t exist today, and we need transformation of the system. It’s not something that we should just be tweaking. It needs fundamental reform, and it hasn’t happened in the last 25 years. It’s hard in a political campaign to get into all the substantive issues, but I can assure you that it will be one of my highest priorities when I’m elected, to make sure we do the things that need to be changed in the system. I’m going to come to some very specific examples, but in general we need to decentralize Medicaid so the states can innovate and experiment and find better ways to care for the most vulnerable people in our society. We need to have information technology revolutionize the way we deliver health care. It’s one of the few areas of the economy that information technology has not revolutionized and allowed us to do much more efficiently, with better outcomes at lower costs. And we ultimately have to reform the payment system. Today we pay for activity versus results and performance or health or keeping people healthy. The more health care you use, the more money you spend, as opposed to incentivizing people for keeping people healthy as opposed to caring for them when they’re sick. If I could ask you a philosophical question: Do you consider health care a right or a privilege? Because before Obamacare, the Republican position has been that health care is a privilege, just like you want to buy a car. I’m a believer that government should stay out of our lives as much as possible. The role of government is important. Government needs to take care of the vulnerable people in our society. It needs to make sure we have safe communities. It needs to make sure we have a strong national defense. But wherever we can, we need to find solutions that are outside the government that create the best value for our people and our country. Regarding immigration, we have this phenomenon the past couple of years of sanctuary cities that protect illegal immigrants from deportation. Some people are talking about making New Jersey a sanctuary state. What do you feel about that? I think that immigration is something we’ve talked a lot about in this country, and there are many people who would prefer not to solve the problem because they think it’s to their political advantage. Certainly, 85 percent of the people in New Jersey that I talk to and the people that I’m aware of believe in very similar views that I have, that sanctuary cities make no sense. We should not be pitting one law enforcement agency against another. The people of New Jersey want to live in a community where they feel comfortable; they’re not looking over their shoulder when they go to the grocery store or their kid goes to school. So, safe, secure cities are important, and sanctuary cities is not the way to do that. If someone commits a crime in New Jersey, they should be arrested and prosecuted. They shouldn’t have places they can go to try and avoid being prosecuted. And the same thing is you’re not a country if you don’t have sovereign borders. If you don’t control who comes in and out of your country, how can you believe you’re fully protecting your country in terms of illegal drugs or criminals coming in? We need to have secure borders. At the same time, we need comprehensive and compassionate immigration reform. Immigration has been very positive for our country. My grandparents were immigrants to this country. Our country is stronger culturally and economically because of immigration, but we should decide who comes in and how many people we want to come in, whether it’s a million people or whatever it is. And we should have a rational process which includes some component of family structure, but also has a merit base — people who are going to have the capability to add value. We need to provide a path to citizenship for people who are building constructive and productive lives here. If you’re a criminal, you should be deported. If you’re building a constructive and productive life, you should have a path to citizenship, not shorter than people who are here legally, but you should have that path. Regarding education, specifically private-school education, there are different things that the administration has either done or is looking at to make it easier for states to provide aid. Is there anything particular that you heard about that you would try to do as a senator? I think first of all, I do believe in choice, for lots of reasons, and I think the most important reason is that it produces competition and the best outcomes for students and the best outcomes for society. In New Jersey we invest over $20,000 per student per year, and that investment is significant, and so we want to make sure we’re getting the best value for that. If you look at underperforming areas, when you inject choice into those areas, the performance of all schools rises. We want to have as much local authority as possible so that people can decide for themselves in their communities what is the best way to provide value for the children in their community. In other words, you’re saying that this comes as a clash of two bedrock Republican principles: school choice versus states’ rights. I’m a believer in school choice, that’s for sure, and governments should support a lot of things we do in New Jersey, like security of the schools, whether public or private, transportation to the schools, whether it’s public or private, and textbooks, whether it’s public or private. I think there are ways that we should support it. There are other scholarship programs that people are looking at that I need to understand better to see if I can find ways to make sure those fit appropriately and can be done to support more choice for schools, including religious schools. I think when it comes to states’ rights, I generally believe we should keep government as close to the people as possible so that when you need to change things, you know who you’ve got to talk to and get things changed. I think there’s a clear role for the federal government in national defense and issues across borders and national issues, and there’s plenty of those, but there’s plenty of things the states should be the incubator and the innovation and the change agent for finding things that they take care of the people in their state. New Jersey wants to find solutions for the people in New Jersey, and we should provide them with the opportunity to do that as much as possible, as long as it meets the national values and the standards that we have as a country. You said your grandparents were immigrants. Where did they come from? I joined the Marine Corps and served on active duty for seven years, and seven years in the reserves after that. I went to business school. I worked on Wall Street at JPMorgan for 14 years, rising to managing director. And then I went to a biotech company 19 years ago that had six weeks of cash left when I joined it — a company called Celgene — and, along with a couple of other folks, helped turn that company around and build it into one of the great anti-cancer companies in our country. And I now believe it’s my time to give back again, when we have a senator who has violated the law and embarrassed us and has failed to deliver for the people of New Jersey, because New Jersey is dead last. We’re 50 out of 50. We get the least back from Washington than any other state in the country, and that’s just not fair to the people of New Jersey. And that’s why my wife and I made the decision that we were morally offended that he would run virtually unopposed if we didn’t step in, and that’s why this race is a dead heat today. Do you find it over the top, this ad accusing you of killing of cancer patients because of a price increase? I think it’s just absurd and it’s just lies and mischaracterizations. I have to tell you, Sol Barer, myself and John Jackson, who turned that company around, have always walked the walk. I’m not aware of one cancer patient with financial need that did not have access to Celgene’s life-saving, life-extending medicine. There were some price increases, I think 7 percent per annum, average. At the same time, the average per annum increase in R&D spending was 37 percent to ensure that new inventions help existing cancer patients and cancer patients of the future. Final question: Is there a Trump endorsement in the works? This election is about New Jersey. It’s Bob Hugin versus Bob Menendez. Bob Menendez would like this to be about Donald Trump because he has nothing positive to run on other than attacking me. Listen, the president’s doing many, many good things — look at the economy, look at what he’s done with the embassy in Jerusalem and Iran. I’m going to support him on everything that is helpful to New Jersey, and if there are things that are not good for New Jersey, I’m going to stand up and oppose. My campaign is about New Jersey first.